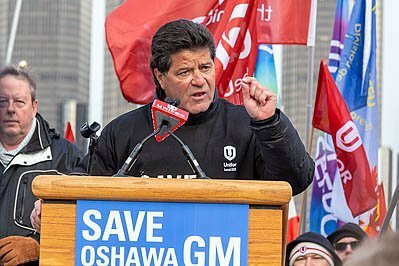 Windsor, Ontario, Canada - 11 January 2019 - Jerry Dias, president of the Unifor labor union which represents Canadian auto workers, speaks at a rally protesting General Motors' planned closing of the Oshawa, Ontario assembly plant. The rally was held across the Detroit River from General Motors headquarters in Detroit. Image Description: Windsor, Ontario, Canada - 11 January 2019 - Jerry Dias, president of the Unifor labor union which represents Canadian auto workers, speaks at a rally protesting General Motors' planned closing of the Oshawa, Ontario assembly plant. The rally was held across the Detroit River from General Motors headquarters in Detroit.